City in the province of Posen, Germany. Jews are first mentioned there in 1553, in connection with a "privilegium" issued by the lord of the manor restricting them in the purchase of leather. In 1624 Juspa Pinner, and from 1631 to 1652 his son-in-law Leiser Pinner, are mentioned as holding various honorary offices in Posen. The community of Pinne, owing to the practise of the Polish kings and nobles of endowing churches with sums exacted from the Jews, became heavily indebted to Catholic churches and hospitals. A divorce case in Pinne in 1764 created a sensation. After the decree had been granted, the man concerned asserted that he had not been the woman's husband, but was another person from Przemysl. This statement led to lengthy discussions, which are given in two contemporary collections of responsa, the controversy continuing until two authorities finally declared the divorce to be illegal. The Jewish tailors of Pinne originally belonged to the Christian tailors' gild, which had received its charter from the lord of the manor; but subsequently they formed a gild of their own, which still existed in 1850. A "privilegium" was given to the community by the lord of the manor under date of June 10, 1789; but the document refers to rights which had been granted before that time. Its thirty-four articles may be summarized as follows: The rabbi, ḥazzan, teachers, and the cemetery are exempt from taxation by the lord; there shall be unrestricted rights of trade; butchers may sell only in the Jews' street, and shall pay two stone of tallow to the castle; admission of foreign Jews may be granted only by the elders of the community, who shall be elected annually at the Passover; the rabbi shall officiate as lower judge, while the lord of the manor shall be the superior judge; if one party to a case is a Christian, the elders of the Jews shall act as lower judges; criminal cases may be brought only before the court of the castle; Jews may not acquire real estate outside of the ghetto; a tax of 600 gulden a year shall be paid to the castle; Jews may not leave their houses during Catholic processions; assaults on Jews by Christians shall be severely punished. When the city came under Prussian rule in 1793 it contained 39 Jewish houses in a total of 129, and 219 Jews in a population of 789. There were 86 Jewish families in the town in 1795; more than 350 Jews in 1827; 847 in 1857; 672 in 1871; and 376 in 1895. The reader's prayer-book contains a prayer for Napoleon I. dating from the time when Pinne belonged to the duchy of Warsaw (1807-15). and Louis Lewin (since 1897). author of "R. Simon b. Jochai," "Gesch. der Juden in Inowrazlaw," "Judenverfolgungen im Zweiten Schwedisch-Polnischen Kriege," and "Gesch. der Juden in Lissa." 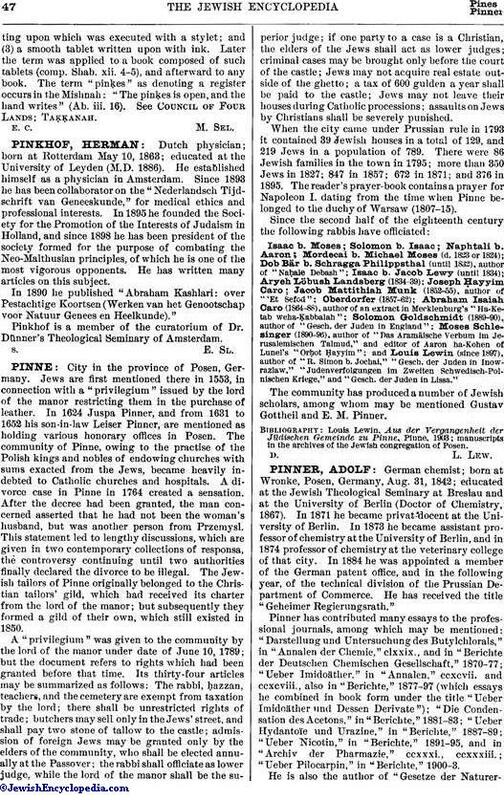 The community has produced a number of Jewish scholars, among whom may be mentioned Gustav Gottheil and E. M. Pinner. manuscripts in the archives of the Jewish congregation of Posen.